One thing I love to do is sit down with a cuppa and read a magazine (when the kids are in school). You can find a lot of information and learn new things from reading a magazine. There is a wide choice of topics such as health, food, crafts, cars, bikes, sports, celebrities, kids and much more. Magazines can be great as treats for kids and gifts for friends and family too for birthdays, Christmas and any other occasion. There is a great offer on at the moment over at magazine.co.u﻿k where if you order a magazine gift subscription before November 16th, you will get a free box of chocolates! magazine.co.uk offer a wide range of magazines for everyone. If you are into health, food, beauty, weight loss, cars then there are magazines there for you and everyone else. There is a wide range of kids magazines to choose from too. 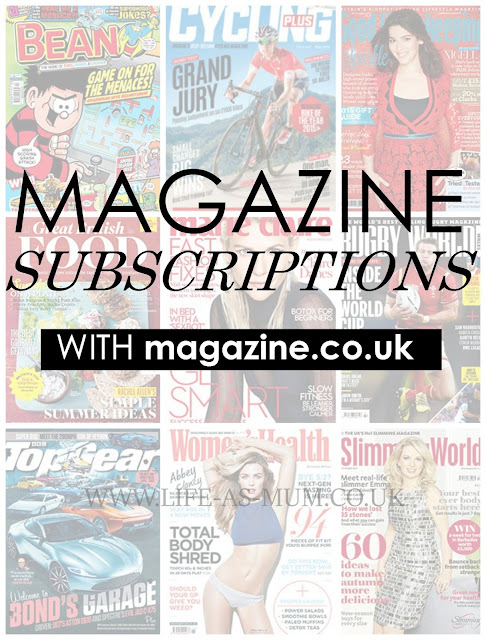 magazine.co.uk offer great discount prices on subscriptions and free delivery which is a bonus. You may have noticed my new badge on the side bar. I am now an approved blogger for magazine.co.uk and I can not wait to start writing for them on the Bloggers Network. I will be receiving 3 magazines of my choice and I will be writing about them, for them. The magazines I have chosen are Slimming World, Gurgle and OK! It's pretty simple to why I chose them as my three choices. Slimming World is something I have been doing for the past 2 years, Gurgle because I was just really interested in it and OK! because I love reading about celebrity gossip! I do love magazine subscriptions as gifts as they just keep on brightening people's days all year round. Your choices sound great - enjoy! Magazines help me very much. I can find a good information in there and relax while reding it. Want to get more pip in here http://custom-writing.services/ Relaxing, I dream of you!